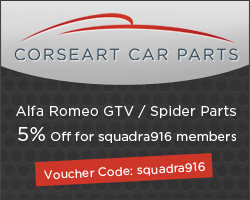 Search the Community: Showing results for tags 'colourcodes alfa romeo spider'. How many 916 colours are there? In the hunt for my own colour number, I started a quest for how many colours the 916 was sold in. I came to this list : AR130 ALFA ROSSOAR195A ROSSO PROTEOAR249 BIANCO BANCHISAAR302A VERDE ACIDO METAR341A VERDE OASI PEARLAR353A VERDE SARGASSI AR400B BLU VELAAR414B AZZURO NUVOLO AR473A BLU ATOLLOAR513 GIALLO ZOEAR601 NEROAR612A GRIGIO CHIAROAR632 BLACK PEARLAR659A GRIGIO ECLISSE AR677 GRIGIO METEORA ( GTV ) Any more? Feel free to add.